This time of year brings some wonderful books to the foreground – How the Grinch Stole Christmas!, The Snowy Day, and especially (and rightfully so) The Polar Express. 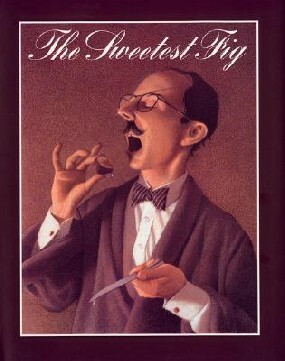 But I thought that I would take this Perfect Picture Book Friday to highlight one of Chris Van Allsburg’s less recognized but equally delightful books, The Sweetest Fig. Opening and Synopsis: “Monsieur Bibot, the dentist, was a very fussy man. He kept his small apartment as neat and clean as his office. If his dog, Marcel, jumped on the furniture, Bibot was sure to teach him a lesson.” When a patient pays the miserly dentist in magic figs that will make his dreams come true, Bibot practices controlling his dreams in order to achieve a life of wealth and grandeur. However, before he finishes the figs, his mistreated dog interrupts his plans. Why I like it: Even as a relatively well-behaved child, or perhaps especially as a well-behaved child, I was drawn to books with despicable villains. Not only is Bibot a well-developed, utterly detestable curmudgeon, but he gets what is coming to him in a way that is humorous, clever and magical. The lovable, neglected dog triumphs to make the ending deliciously satisfying. Related Activities: The Sweetest Fig is a perfect introduction to dreams. Dreams are as fascinating to kids as they are to adults, and there is a wide range of activities revolving around them. I find dreams fascinating and wish I understood them better. This story seems different from the “usual” and I’d love to pick it up for my kids. Thanks for sharing! I love Chris Can Allsburg but have never seen this story before. (Of course, I confess that when I first saw your link on my blog I was not wearing my glasses and I thought the book was called The Sweetest Pig – I guess that would be a different kind of story! :)) Anyway, this sounds like a wonderful book. I’d love anything where a mistreated dog triumphs! Thanks so much for joining in the Perfect Picture Book fun and for sharing this book which I will have to go to the library and find ASAP! Thanks, both of you, for stopping by my blog. I hope you enjoy the book as much as I did! I also love Chris Van Allsburg, but never saw this treasure! Love a villain. Love it that the dog wins in the end. Will have to check this one out at the library. Thanks so much for sharing. Great review! Well I guess if you notice my name I am a dreamer and this sort of book would fit very nicely in my home. Love it for myself and thanks for the dream activity link, will go check it out. Great review! I’ve never heard of either, thanks so much for introducing this author to me. It sounds very original indeed. I too love Chris Can Allsburg but have never seen this story before. I am so glad the old dog has the last say! Monsieur Bibot does sound up there with some of Dahl’s awful villains! I loved all your dream activities and this book recommendation. Thanks, Laura. I like stories with villains too – especially when they loose in the end! Thanks, everyone! I’m glad I was able to introduce a new picture book to so many of you. Hope you enjoy it!